The central part of Hoy Island justifies the stereotypes about harsh, nordic, desolate Orkney Islands. Wild cliffs rise above the desert-like peatlands, no trees or shrubs are seen. 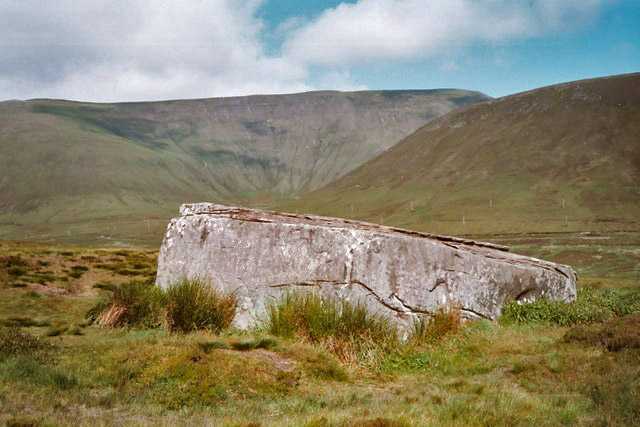 Here, in the peatlands (corries) between Quoys and Rackwick is located mysterious monument of the past – Dwarfie Stane. Dwarfie Stane is rougly quadrangular stone block, formed by Old Red Devonian sandstone. This giant stone is 8.6 m long, 4 m wide, up to 2.5 m high. Earlier some researchers considered that it has fallen down from the nearby cliffs – Dwarfie Hammars. Now it is believed that Dwarfie Stane is glacial erratic – once caught in the mighty ice stream and, as the ice melted, left in occasional place. Not too far is another enormous sandstone slab – Partick Stane – also glacial erratic. What makes this stone unique is an ancient chamber with an entrance cut in the western side. The entrance is square cut, 1 m wide and high. Inside there is a 2.2 m long passage with two side cells (similar to larger shelves), each measuring 1.5 – 1.7 by 0.8 – 1 m, height is roughly 0.7 m. In one cell is a "pillow" – uncut rock elevation in the inner end of cell. Both cells are too small for people of normal height. In the front of Dwarfie Stane lies smaller stone. It is measured 1.5 by 0.7 by 0.6 m and weighs 1.5 tons. This stone corresponds well to the entrance – one could plug firmly the entrance with it. 30 metres east-south-east from Stane is another big boulder which also may serve well as a a closing stone. It is 1.55 x 1.05 m large and 0.8 m thick. One end has been shaped as a "stopper" and this has been done more neatly than for the stone now lying in front of Stane. It is also possible that there was alignment of more stones around Dwarfie Stane – there are located larger boulders near the corners of Stane. 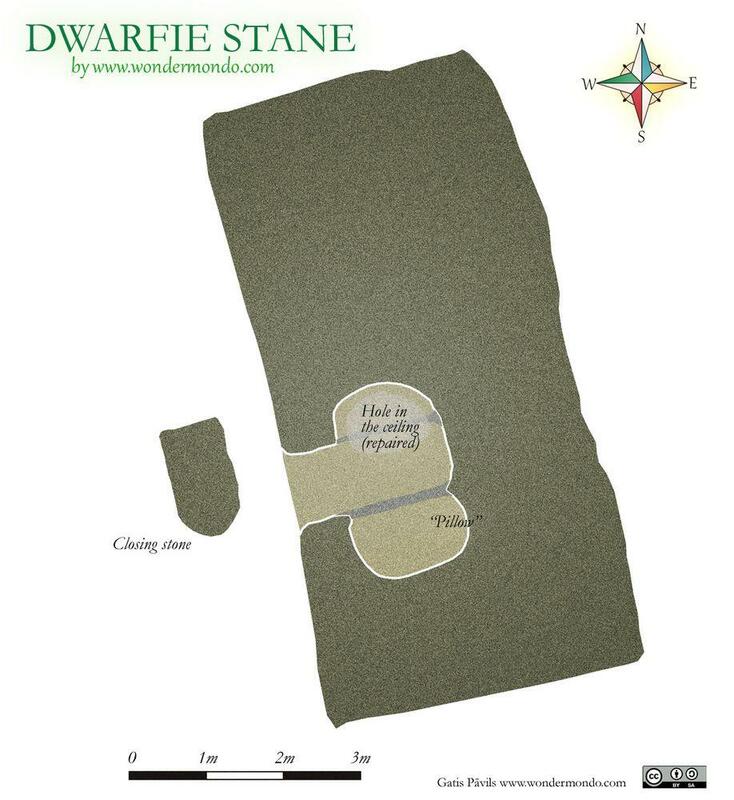 There are no known archaeological excavations near Dwarfie Stane. It is also not possible to tell the exact age of this structure by the form or marks on the walls of chambers. Nevertheless specialists consider that it has been made in the late Neolithic Age or in the Bronze Age. Such rock cut chamber is not unique in the world – similar prehistoric structures are known in Asia and also in southern Europe, Mediterranean region. 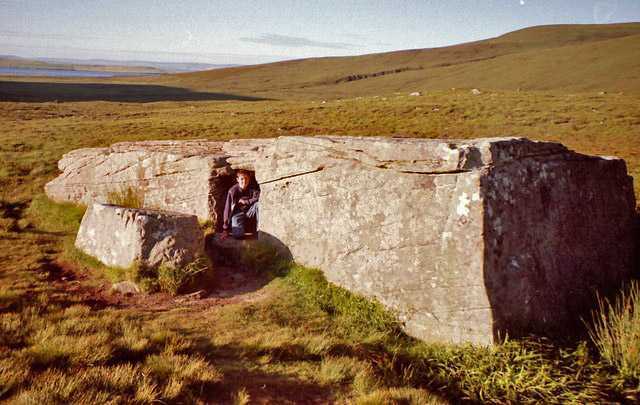 Prehistoric people have made other hollows in the rock in Britain as well – nearby on Orkney Islands are known so called sub-megalithic tombs, such as Huntersquoy cairn. Here the ancient graves have been cut in rock from above and then covered with stone clabs. 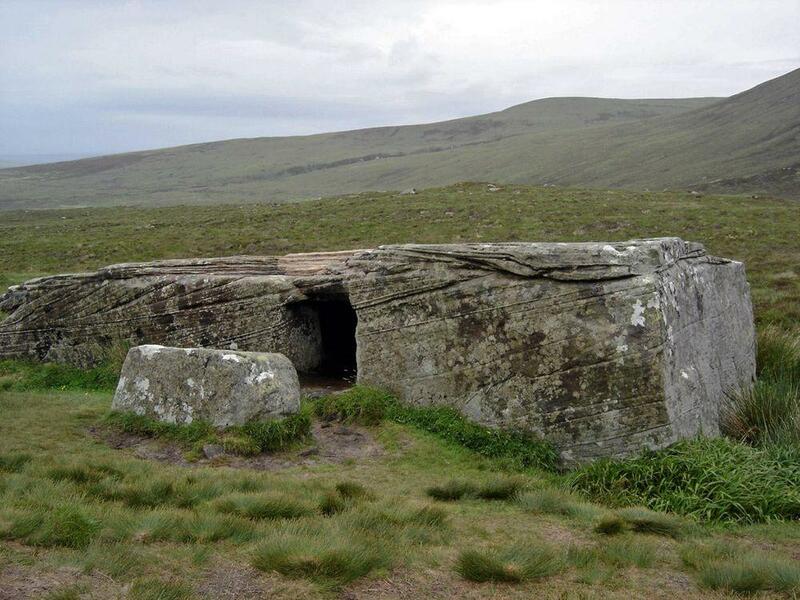 Similar sub-megalithic tombs are known also in Wales. 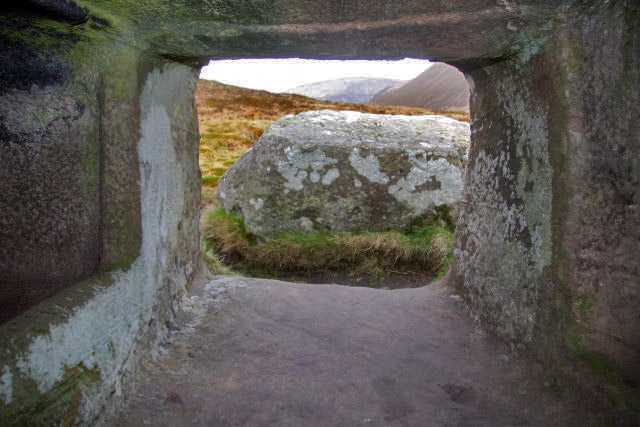 At least one rock chamber of unknown age (St Kevin’s Bed) is made in Ireland. 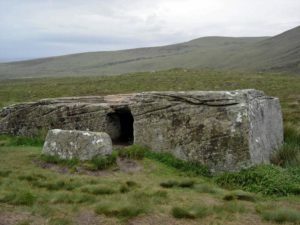 Nevertheless Dwarfie Stane is unique monument: the only prehistoric system of chambers in Britain hewn entirely in stone. Also the stone "door" is unique for Britain and – for Europe north from Alps. Nowadays it is supposed that the hollows in Dwarfie Stane served as a tomb. Even the planning of this structure corresponds to a certain class of prehistoric tombs – so called Orkney-Cromarty class of chambered tombs. Some specialists consider that it is similar to Bookan-class with a prototype in Mainland of Orkney Islands. Dwarfie Stane has been mentioned already in the 16th century by the mysterious Jo Ben in his work "Descriptio Insularum Orchadiarum". Already then the tomb was plundered – according to Jo Ben in this time there was already a hole in the ceiling of tomb. It is not explicitly clear whether the enormous stone "door" then was still in place – but later, in the 18th century it certainly was pushed out and now is lying in the front of stone. It is not likely that the door was pushed out before the hole was made in the roof. The hole in the ceiling was large: the sunlight shines through the hole. In the 1950s or 1960s Scottish Development Department closed the hole with concrete. As the tomb is plundered and there have been no archaeological excavations near the Dwarfie Stane, specialists are just guessing why the rich archaeological heritage of Orkney Islands includes such an unique "outsider". R. Castleden (The Stonehenge People. 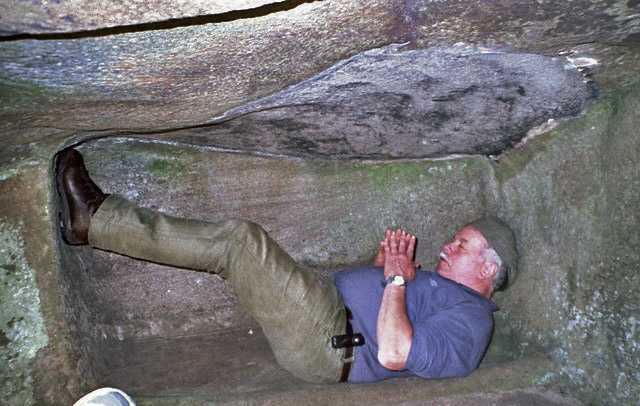 An Exploration of Life in Neolithic Britain 4700 – 2000 BC, 1987) writes: "It would appear that the imported idea of the rock-cut tomb was tried only once and found to be unsatisfactory. Perhaps the sandstone was too hard compared with the soft limestones of the Mediterranean, or else the alternative of using the natural flagstones that split so easily into fine building stones seemed more attractive." Nevertheless this is pure hypothesis without proof, there is no evidence of connections between Mediterranean Neolithic cultures and Orkneys. This large hollowing was made in Stone Age – thus it been made with stone tools. Nowadays this seems to be almost impossible. We are facing many amazing achievements of prehistoric people around the world – Dwarfie Stane is one more such achievement. Surface of the carving is smooth – there are just marks of the tools seen on the ceiling of the southern (right) chamber. The sandstone nevertheless has been soft enough for many people to leave inscriptions over the last centuries. Some are of historical value. One such inscription is left by William H. Mounsey (1808 – 1877) – amateur archaeologist and romanticist by nature. This man earlier served as a British spy in Afghanistan and Persia and as a result mastered Persian language. He left a Persian inscription on the south face of stone, which is translated as "I have sat two nights and so learnt patience". He spent here some nights in 1850 and most likely had to endure annoying midges of local mires, what really is a trial to patience. Above the Persian inscription is his name written in Latin and backwards – YESNUOM SUMLEILUG. This gloomy area has no shelter and few other archaeological monuments nearby. But the outstanding nature of Dwarfie Stane nevertheless has caused origin of some legends. First and the best known comes already from Jo Ben, the 16th century. He wrote that the stone was shaped by a giant and his wife. There are beds made for the man and wife in this stone. Another giant disliked the one living in a stone – he made a stone and blocked the doorway, leaving both the man and his wife as prisoners in the stone. The goal of the violator was to rule the island. Imprisoned giant made a hole in the roof with his hammer and thus ruined the evil plans of his enemy. There is a big drawback to the previous story – the chambers are not suited even for a normal human, not speaking of giants. Thus there are stories about dwarves living in this stone as well. Such legendary dwarf stones are not unique for Orkneys. There are dwarf stones also in Iceland and Norway – Dvergasteinn, although these stones are far less exclusive than Dwarfie Stane. "Put for my misfortune, I was chiefly fond to linger about the Dwarfie Stone, as it is called, a relic of antiquity, which strangers look on with curiosity, and the natives with awe. It is a huge fragment of rock, which lies in a broken and rude valley, full of stones and precipices, in the recesses of the Ward-hill of Hoy. The inside of rock has two couches, hewn by no earthly hand, and having a small passage between them. The doorway is now open to the weather; but beside it lies a large stone, which, adapted to grooves still visible in the entrance, once had served to open and to close this extraordinary dwelling, which Trollid, a dwarf famous in the northern Sagas, is said to have framed for his own favourite residence. The lonely shepherd avoids the place; for at sunrise, high noon, or sunset, the misshapen for over the necromantic owner may sometimes still be seen sitting by the Dwarfie Stone." Another author – Charles John Shore (Sketches of the coasts and islands of Scotland, and of the Isle of Man, 1836) – considered the carving to be an apartment, where one room is suited for sleeping and the hole is suitable for cooking. He wrote that, according to local legends, it was a habitation of dwarf married to giant. Local pastor Mr Barry (the 19th century) considered this to be an abode of hermit. In earlier times – up to the early 20th century – visitors to the stone left some offering. "At the west end of this stone (Dwarfie Stane) stands an exceeding high mountain of a steep ascent, called the Ward-hill of Hoy, near the top of which, in the months of May, June, and July, about midnight, is seen something that shines and sparkles admirably, and which is often seen a great way off. It hath shined more brightly before than it does now, and though many have climbed up the hill, and attempted to search for it, yet they could find nothing. The vulgar talk of it as some enchanted carbuncle, but I take it rather to be some water sliding down the face of smoothrock, which, when the sun, at such a time shines upon, the reflection causes that admirable splendour." This legend coincides with another, fairly recent story by John Bremner (Hoy the Dark Enchanted Isle, 1997). Mr. Bremner tells that he found in a cave in Dwarfie Hammars (rugged cliffs near Dwarfie Stane) a stone egg. This egg was some 15 cm long and polished – possibly it served as a fertility symbol. Unfortunately there is not seen an image of this unique item and the exact location of cave is not clear either. Skara Brae – unique Neolithic village / yellowbook, Flickr / CC BY 2.0. 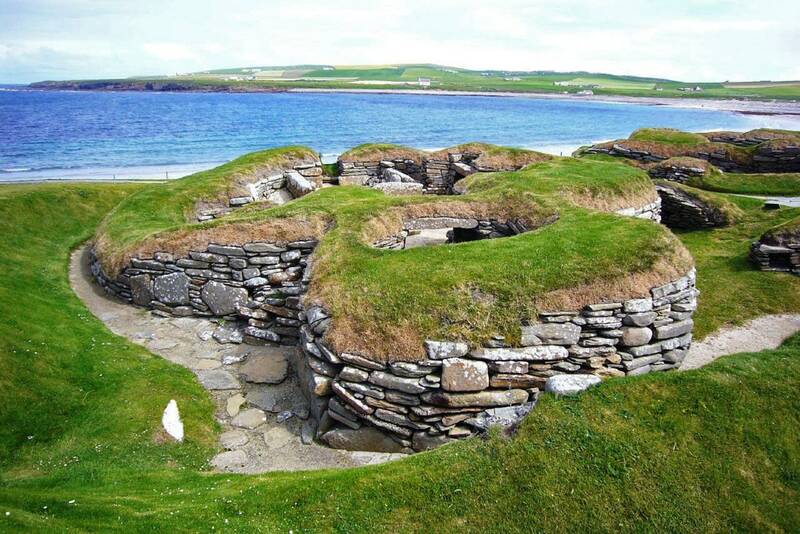 Some of the wonders of Orkney Islands are known internationally, but the true scale of the cultural heritage found on these small islands is hard to grasp. Remote, desolate islands are packed with remnants of past cultures and too often it is obscure to us: why this or that was built and even – how it was accomplished. 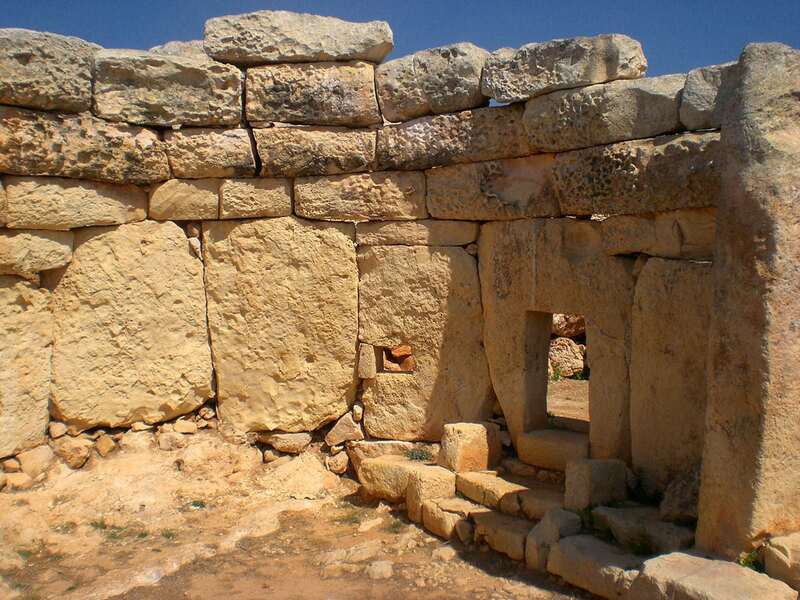 One of the most fascinating groups of archaeological monuments are prehistoric structures made of stones – megaliths. Through the ages, people have loved to strain their minds to find a sensible explanation to the many riddles posed by megaliths. Even today, we can admit with some pleasure, there are thousands of mysteries left for us. A marvelous companion to the fascinating Orkney islands, Orkney: A Historical Guide offers a broad overview of their history. Starting with the prehistoric period, from which survives the famous settlement of Skara Brae, it goes on to discuss the flowering of the Celtic Church in the sixth and seventh centuries and the subsequent invasion by the Vikings, who settled there in large numbers and established a powerful Norse earldom. Their names bespeak a rich and varied past, belying their paucity of notice by historians. From the Norse Hjaltland comes the modern Shetland: islands nominally Scottish, steeped in Nordic culture, closer to the Arctic Circle than to London. Important Neolithic sites at Skara Brae and Maes Howe in the Orkneys wallow in anonymity next to Stonehenge. Holy Iona, island center of Celtic Christianity; the Isle of Man, former seat of rule over the Irish Sea; Anglesey and Islay, homes of forgotten Medieval courts at Aberffraw and Loch Finlaggan—these are just a few of the more than 6,000 islands that form the archipelago known as the British Isles.